An introduction in the form of three lectures given in Switzerland in 1973 by Herbert Witzenmann to the Course on World Economy given by Rudolf Steiner in Switzerland in 1922. Translated and introduced by Robert Jan Kelder and first presented in bookform in 1998 during the annual meeting of the Social Science Section of the Goetheanum, Free School for Spiritual Science in North America. The central Council will have to consider its task to be solely whatever lies in the direction of fulfilling the Statutes. It will have to do everything that lies in the direction of fulfilling the Statutes. This gives it great freedom. But at the same time we shall all know what this central Council represents, since from the statutes we can gain a complete picture of what at any time it will be doing. Dr Steiner: On the whole the imprint will apply only to the lecture cycles and those publications which are equal to the cycles. Herr Werbeck: What about the National Economy Course given here. Does that count as a cycle? In so many words, Rudolf Steiner therefore states that his World Economy Course too is to be nurtured, further developed and spiritually protected by the Anthroposophical Society and the Goetheanum. In effect, this means nothing less than that since the Christmas Conference the Goetheanum School also has the task of realizing the new form of the idea of the threefold social organism, here called social organics, in the world. This is something Herbert Witzenmann has constantly endeavored to do from the time that he became leader of the Social Science Section at the Goetheanum in 1965 until his – as he himself writes – removal under coercion from this position by a majority decision of the Executive-Council (Vorstand) of the General Anthroposophical Society in 1972. Afterwards he continued this task, so to speak, in the shadow of the Goetheanum until his death in 1988. To what extent he succeeded in that task may be left up to the judgment of the reader. The foregoing serves to explain to those anthroposophical readers who were perhaps inclined to ask why these three lectures by Herbert Witzenmann on Just Price were not given in Dornach, but in the nearby village of Arlesheim. Those readers interested in the related question why it has taken 25 years for these three lectures to reach American shores, I refer to my booklet Munsalvaesche in America – Towards the New Grail Community and other relevant literature listed at the end of this publication (not included here, will eb put online soon). Suffice it to say, that after the removal of Herbert Witzenmann from his chair at the Social Science Section, the threefold social idea in this crucial new form was unfortunately all but neglected by the new occupant of this chair in the person of the late President of the General Anthroposophical Society, Manfred Schmidt-Brabant. How this can be done has been shown by Rudolf Steiner in his course on World Economy in Dornach 1922. In the first of these 14 lectures he states that what he is about to deliver is the new language, even the new way of thinking with which to present the threefold social order in the near future, and that it is above all necessary to come to an understanding of the concept social organism as consisting of humanity and the earth as a whole. This unity was already seen in the spirit by Casper Hauser, who is a vital link in the historic Grail line. The social organism is thus essentially the body of Christ; but He can only wholly incarnate into this earth, if we as humanity practice the threefold order in the sense of Rudolf Steiner’s World Economy by creating the right balance among the production factors of the social organism: nature, labor and capital (spirit). This is the Christian justification for taking up the threefold social order or social organics, a term I think that Thoreau would welcome into his Walden and Walt Whitman would plant in his Leaves of Grass. Again, this veiled ‘internal’ opposition to the true proponents of Rudolf Steiner’s impulse is one of the main reasons that it has taken so long for these vital matters to reach American shores, but come they must and come they will. I am therefore grateful for the support of the organizers of the second and third conferences, namely Bernard Wolf (Social Science Section) and Stuart B. Weeks (Concord Convocation), and others such as the New York City economist David Gilmartin given to my proposal to translate these three lectures during the two weeks between the first and second conference, and present them afterwards as study material. This as a further step in introducing the concept of social organics to America." The actual translation of The Just Price was begun on my laptop on June 21 in David and Laura Lee Tresemer’s Morning Star House just outside of Boulder, Colorado, and continued three days later in the great New York Public Library, whose marble walls provided a welcome albeit temporary relief from a blistering heat wave. Over the 4th of July holiday the proofreading was done with the help of David Gilmartin, who was also so kind as to put me up during most of this time and who also helped finance the printing. Without his help, this working translation would have hardly made it. The synopsis here was translated from a summary made for a Dutch working trans­lation of The Just Price that was presented in Amsterdam in 1994 by the translator as study material for the Willehalm Institute for Social Organics. 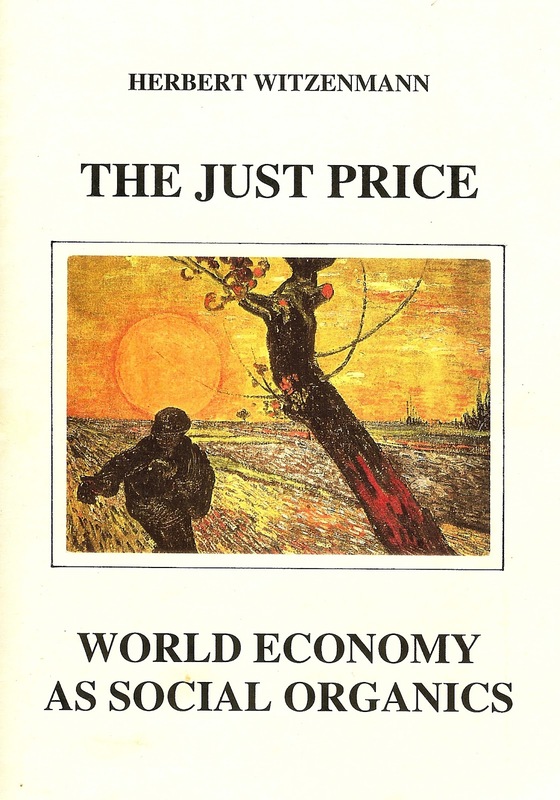 The foreword to the German edition of The Just Price by Dr Götz Rehn was not included here, because of lack of time. In this foreword, credit is given to Hans Mrazek who wrote in shorthand the lectures on which the German text is based. 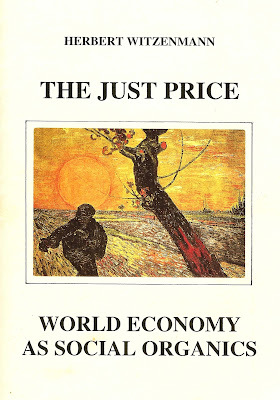 The quotations from the World Economy Course are taken from the version by A. O. Barfield and T. Gordon Jones published by the Rudolf Steiner Press in 1972, but here and there I have made what I consider some improvements. I have not made the English pronouns gender neutral, with my apologies to the feminists. Rudolf Steiner, The Christmas Conference For The Foundation of the General Anthroposophical Society 1923/1924, Anthroposophic Press 1990, p. 115 ff. In this translation, the last part of the last sentence reads “what it (i.e. the Council) is doing”, which weakens this statement considerably, for the German word jemals, meaning ever or at any time, has been omitted. Another, more fundamental problem is the question of the title of this book, which refers to The Foundation of the General Anthroposophical Society. As pointed out in the forewords and footnotes to the statutes in my working translation of Herbert Witzenmann’s social esthetic study The Principles of the Anthroposophical Society, which is appearing simultaneously in an updated edition with this present booklet, it was not the General (note the G written as a capital letter) that was founded, but the general Anthroposophical Society (i.e. general as opposed to the national or particular Anthroposophical Societies that were founded as groups of the general society) . During the Christmas Conference, Rudolf Steiner uses both terms interchangeably, but he emphasized that there is in effect only the Anthroposophical Society, the rest are local groups. Moreover, the statutes that were endorsed as well as the membership cards that were issued both read Anthroposophical Society. The General Anthroposophical Society as such derived its name and identity from the Goetheanum Building Association that on February 8, 1925 changed its name accordingly and added to it three sub-divisions, namely the administration of the Anthroposophical Society, the administration of the Goetheanum building itself, the Anthroposophic-Philosophical Publishing Co. and the Clinic. See the foreword to the fifth edition of above-mentioned booklet on the principles for further background information to and insight into this thorny constitutional issue and a solution in the form of a three-act real life mystery play entitled the Kardeiz Saga. See also the coming, revised edition of Munsalvaesche in America – Towards the New Grail Community. This paragraph reads (in my translation): “All publications of the Society shall be open to the public as is the case in other public societies. The publications of the Free School of Spiritual Science will not be exempt from this public availability; however, the leadership of the School reserves the right from the outset to challenge the validity of every judgment on these works, that is not based on the schooling of which the works themselves are the outcome. In this sense the leadership, as is altogether customary in the recognized scientific world, will not acknowledge the validity of any judgment that is not based on the appropriate preliminary studies. Therefore the publications of the Free School of Spiritual Science will contain the following imprint: "Printed in manuscript for the members of the Free School of Spiritual Science, Goetheanum, Class ... No person is held qualified to form a judgment on these works who has not, through the School itself or in an equivalent manner recognized by it, acquired the preliminary knowledge advanced by the School. Other opinions will in so far be rejected, as the authors of the works in question do not enter into any type of discussion concerning them." Rudolf Steiner, The Christmas Conference…, p. 153 f.
 See the foreword to this third edition for a response to criticism of the editors of the American journal The Threefold Review that Herbert Witzenmann misinterprets and misrepresents Rudolf Steiner’s Course on World Economy. M. Schmidt-Brabant, who passed away earlier this year, was a brilliant speaker and did much to somehow improve the (outward) appearance of things. However, next to his discontinuation and glaring neglect of the new, actual form of the idea of the threefold nature of the social organism as developed by Rudolf Steiner and expounded by Herbert Witzenmann – a form which later in this foreword is referred to as a, or even, the Grail impulse of the 20th and 21st century – he withdrew the attention from Arlesheim Hermitage to Santiago de Compostella in northern Spain (formerly Portugal) as the central Grail area. See also my introductions to Werner Greub’s How The Grail Sites Were Found – Wolfram von Eschenbach and the Reality of the Grail that was recently published by the Willehalm Institute Press in Amsterdam and presented in Montreal and various libraries in New England including the Rudolf Steiner Library in Ghent NY. On the vitally important but still relatively unknown, so-called, book question, which in fact is a question concerning the proper representation of Rudolf Steiner’s anthroposophy, the nature of the Anthroposophical Society and its research and development center, the Goetheanum, Free School of Spiritual Science, see H. Witzenmann The Principles of the Anthroposophical Society and Munsalvaesche in America by the author. German titles: Geldordnung als Bewusstseinsfrage, Gideon Spicker Verlag, 1995 and Sozialorganik – Ideen zu einer Neugestaltung der Wirtschaft, G. Spicker, 1998.